As her Department of Health profile states, former Health Secretary Janette P. Loreto-Garin is a physician and a state legislator for 9 years, shepherding the Magna Carta for Women, Cheaper Medicines Law, and the Responsible Parenthood and Reproductive Health Law among many others. She was trained as a medical technologist and after medical school had a background on Obstetrics and Gynecology. Her passion for public health, specifically that of women and children, led her to Masters Degree in Business Administration focused on healthcare systems. In tracing her genealogy, one could find certain ironies. For one, her married name, Garin, is a Spanish last name that is derived from the Basque GARÍN, a variant of the Germanic name Garindo or Garino, which both have been used as a surname and a first name throughout history. Furthermore, Garindo or Garino comes from Guarino, itself derived from Warino, Waran, and Warin, which means “protect” or “defend”. Secondly, she is further admired for her understanding the plight of women, children, the elderly, and the less privileged as well as being a front liner in advancing the advocacy on maternal health and child mortality. For somebody who has been accused of endangering the lives of Filipino children due to the Dengvaxia vaccine, one could definitely not miss the irony in her genealogical information and the Dengvaxia issue. But one thing that is being left out here is that there is another interesting connection to Janette Garin: in another ironic twist, President Duterte, who heads the current administration which has been investigating her for her involvement in the purchase of the controversial vaccine under the previous administration, just happens to be her cousin. 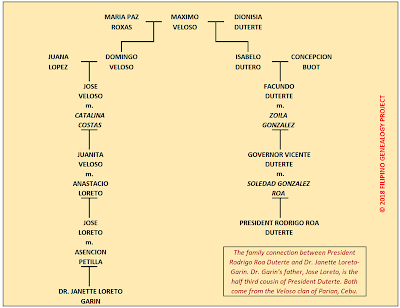 Or, to be precise, President Duterte and Garin's father, Jose Loreto, are half third cousins, which means Dr. Garin is President Duterte's half third cousin once removed. In the simplistic generational count in Cebuano, Garin is Duterte's pag-umangkon sa pag-agawan. A brief discussion of President Duterte's descent from the Veloso clan has already been discussed in a previous article. The Velosos were an old family from Cebu that in the words of its family historian, Cirilo Veloso, "and was one of the political families that have grown so big and extensive that they have established family associations to organize reunions and keep in touch with each other; in their case, the Veloso Association of the Philippines whose members count many important politicians." Indeed, the Velosos truly are a marvel when it comes to branching out to become another political dynasty. 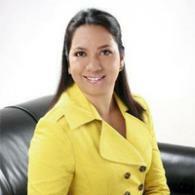 In Garin's case, she belongs to the Leyte branch of the Velosos who married into the Loreto, Petilla, Cari, families. Garin's father, Jose, was a mayor of Baybay, Leyte. Her brother, Carlo, served as Vice-Governor of Leyte. Uncles, aunts, and cousins also served (or serve) as house representatives, governor, vice-governor, mayor, and other positions in and around Baybay and Palo, Cebu. 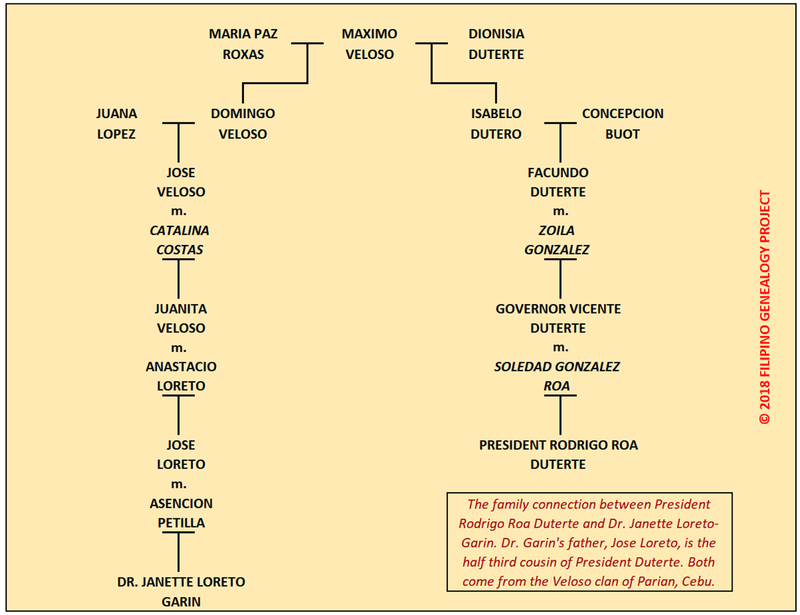 And in the grand tradition of the Velosos marrying into other political families, Janette Loreto also allied herself with another established political dynasty, the Garins of Iloilo. Janette's husband, Iloilo 1st district representative Oscar "Richard" S. Garin, Jr., belongs to the Garin dynasty of Iloilo headed by Oscar Sr. In the last election alone, Iloilo's 1st District remained the bailiwick of the Garins. Oscar Sr. was elected mayor of the town of Guimmal while the matriarch, Ninfa, became mayor of the municipality of San Joaquin. Janette's sister-in-law, Christine, was elected vice governor of Iloilo while his another in-law, Sharon, won as a representative of the Aambis-owa Party-list.